There’s nothing like a heavy, sticky pudding to really fill you up. These recipes are all for good old-fashioned English puddings - and they can all be made without sugar. Try them all with custard or cream. And if you really want a treat, why not spoon on a little extra sugar free jam! An old favourite for those of a certain age! 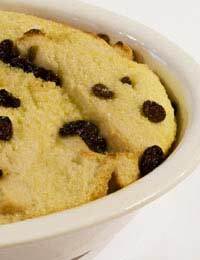 This pud is a great way for using up old slices of bread that are just a little stale. Preheat your oven to 180 deg C/350 deg F/gas mark four. Take a large ovenproof pudding dish and grease with butter. Cut the crusts off your bread. Take the rest of your butter and spread it on to one side of each slice of bread. Place the bread face up on the bottom of the dish, sprinkle on some sultanas and cinnamon. Do the same again until your dish is full. Beat your eggs with your granulated sweetener. Heat your milk and then slowly stir into your egg mixture. Pour the hot sauce over the bread layers, sprinkle with nutmeg. Leave to stand for five minutes before baking in the over for about half an hour, or until golden on top. This is a great dish because you can vary the flavour by simply changing your sugar free jam. Once in a while, you try it with honey too. Lightly grease a heat proof pudding basin. Into the bottom, spoon your sugar free strawberry jam. In a separate bowl, beat your eggs with your sugar free apricot jam. Slowly stir in your self-raising flour. Take your sponge mixture and carefully spoon it on top of the jam, taking care not to mix it in. Cover your pudding basin with a circle of grease proof paper, making sure the sides overhang, and tie with string. Place in a large pan of water with a lid on top, bring to the boil. This is another favourite from years gone by, a really filling pudding that your parents and grandparents would have enjoyed. It’s always popular with those who love dried fruit. Take a large bowl and sieve your dried ingredients into it. Stir in your vegetable suet. Then add your milk and mix until you have a dough. Roll the dough out into a long oblong. Spread your raisins over the top then roll up into a tube. Wrap in a clean tea towel and steam in a large pan in boiling water for about an hour.